I bought some denim on sale a few months ago intending to make a simple A-line-ish skirt for summer. And it sat and sat and already I can feel the chill in the morning air. Finally, after my shopping trip this weekend (wherein I tried on a seemingly cute skirt that made me look like a balloon) I was motivated to make it. I am holding on to the last days of summer with a death grip! 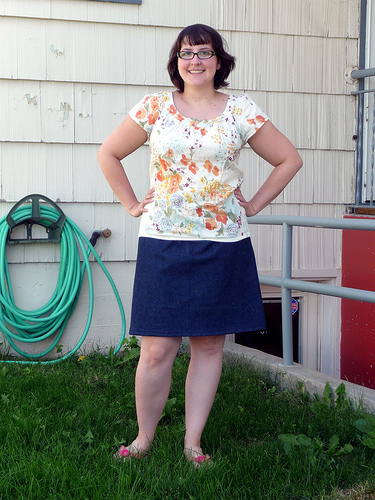 I cobbled together the pattern from the skirt in Wendy Mullin’s book, Sew U. I had my concerns because the skirt only goes to a size L so I cut it a little wider, a little shorter, a little more flared, etc. I ended up making it too wide and had to take it in, but better safe than sorry. I finished the top with a super simple bias binding and put a 7″ zipper in the back. I plan on making at least one more of these out of corduroy (I bought some of that too, intending to make a skirt last winter), so I’m going to actually draft out the pattern since this one fits perfectly- not too loose, not too tight. This skirt is so easy, especially if you don’t add a lining or facing, that leaves you with only 2 pieces to cut. It also takes very little little fabric- I don’t know why I didn’t sew one sooner! I have a confession to make, too. The other reason why I sewed the last two projects was that I caved in and bought some Denyse Schmidt Patchwork Promenade fabric when I saw it available again (it’s already gone again, so good thing I did!). And you know, some Anna Maria Horner for good measure since I was paying shipping. I sold something on ebay so I had basically free money, and I couldn’t help myself. I’m trying to at least abide by the rule that I can only add what I take away (so 2 lengths of fabric in means 2 similar lengths of fabric already out of the stash must be used or given away). So far so good. oh you are wonderful! that skirt is so perfect-- I too bought some denim back when i was pregnant intending to make an a-line knee length skirt and it is still in the closet! you're totally inspiring me to get it out and make that skirt finally. i think your rule is brilliant and must apply it to my endlessly fabric-buying self. That looks like a cute picture of you! and that skirt turned out great. A great outfit for these summer days. I agree with amy - you're so talented to make your own patterns for clothing or modify them so much. Very impressive. I think it's okay that you bought new fabric because you've been using so much lately on these projects. Great plan to buy some when you use some, kinda like cleaning out your closets to make room. I should be more disciplined, ahem!